Fluctuations in intensity of human impact and corresponding vegetation changes have been reported from different parts of Europe for the period from the beginning of the 1st millennium ad to the high Middle Ages. In the Bílé Karpaty mountains (White Carpathians), a region well-known for its biologically valuable ancient grasslands, an extensive spread of woodland could have occurred in the Migration period (4th–6th century) and especially in the Confinium period (11th–12th century), when settling of this border region was legally prohibited. However, Holocene continuity of non-woodland vegetation was suggested as an explanation for the unique species richness of the local grasslands. If this explanation is true, then the turbulent times in medieval history could not have led to complete re-establishment of woodland. To test this idea palaeoecologically, we analysed four new profiles from wetland deposits for pollen, macrofossils and abiotic proxies, and re-dated some old profiles from the area. The results show the continual presence of human impact indicators since the Migration period in the southwest of the Bílé Karpaty, where these unique grasslands occur. 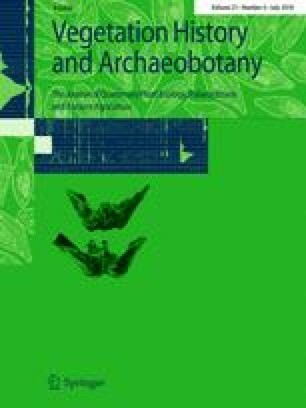 Agricultural activities were indicated by pollen of crops, ruderals, weeds and grassland taxa and by macrofossils of fen-grassland plants. Grazing and burning seem to have been the main disturbances during the older period, while mowing of meadows by scythe became more important since the 17th century. Fossil records differed among the sites as a consequence of differences in altitude and disturbance regimes, but converged gradually with time. Despite intensification of human activities, the landscape remained mosaic-like. Indicators of undisturbed woodlands have been detected only in the northeast. Continuous yet perhaps never too intensive disturbances might therefore have maintained the ancient grassland species pool in the long term. The online version of this article ( https://doi.org/10.1007/s00334-017-0660-9) contains supplementary material, which is available to authorized users. This study was funded by Masaryk University (Project no. MUNI/M/1790/2014). Analysis of modern pollen spectra has been supported by the Czech Science Foundation (GA ČR 16-10100S). PH, EJ, LD and JR were partially supported by a long-term developmental project of the Czech Academy of Sciences (RVO 67985939). We are grateful to colleagues and friends who helped us with coring in the field (P. Kuneš, B. Werchan, M. Lamentowicz, Jakub Roleček, K. Fajmon), provided valuable comments on regional history (J. Mitáček, J. Macháček, M. Ďuga, P. Szabó), helped with the review of archaeological data (B. Machová, M. Vágner) or sampled recent pollen and vegetation and willingly provided us with unpublished data (B. Werchan and Z. Plesková). Michal Horsák kindly provided identified snail shells from his personal collection.